The audience at the two talks by Lone Droscher-Nielsen on her orangutan rehabilitation centre in Borneo was taken on a raw ride of emotions as we were exposed to the cruelty metered out to these benign and intelligent animals and the effects on them of the appalling loss of their rainforest habitat. Some of the strongest footage was of an adult female instinctively climbing a tall stump of a dead tree (resembing a telegraph pole), which had been part of dense rainforest until very recently. The orangutan had lost its habitat and food source and it had nowhere to go - until Lone's team stepped in.. But the harrowing images and stories were balanced by the pictures of flourishing orangutan orphans, cared for at the centre, and the positive news that a momentum is bulding to acquire thousands of hectares of virgin rainforest as a perfect release site for some orangutans, which are solitary creatues. However, the problem still exists of the clearing huge areas of rainforest to create palm oil plantations. And, in a startling passage, Lone revealed the extent to which palm oil from unsustainable sources is contained in food and household products that we all use daily - including museli and shampoo, as well as more obvious products, like margarine. There were some unbearably moving passages in which Lone described rescuing starving adult orangutans, wandering in the destroyed rainforest trying to find food and a place to rest. Others were taken from appalling conditions in which they were held as pets or in constricted cages before being shipped out of Indonesia in the ilegal pet trade. 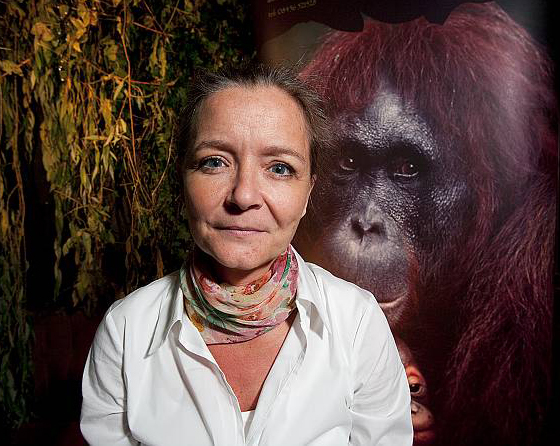 Through out it all, though, Lone emphasised she is not opposed to palm oil production per se, but simply that which destroys rainforest and, as such, is unsustainable. She also realised that some small-scale farmers are reliant on its production and they need to be offered incentives as an antidote to clearing the forest. The chief focus of campaigners' anger, without doubt, is the large corporations which have the financial power to obtain permits from the government to use mass-clearing techniques, such a bulldozers, to raze vast areas of forest - and obliterate the orangutan in the process. But Lone's talk finished on a highly optimistic note, replaying footage from Orangutan Diary on BBC Two. In a highly moving sequence, a female and her baby were airlifted by helicopter to a rainforest release site after their rehabilitation and we watched as the mother climbed high into the canopy to look for food and materials to build a nest for her baby. Lone gave talks on consecutive nights, November 13th and 14th, and - despite fierce storms - there were combined audience figures of 151 and with total proceeds of £950, which was a record for the twelve talks so far. It pushed the total cash raised to £6,461 and we are very grateful for the continuing support. Donations for Lone's project in Borneo also totalled nearly £400, in addition to the sale of merchandise, including Lone's book and DVDs of the BBC's Orangutan Diary. In particular, soft toy orangutans sold out rapidly - to all age groups. Earlier, Lone had spoken to all the children at Wootton School about the plight of the orangutans and the best way to try and save them from extinction. She was deluged with terrific questions and she felt many future leading conservationists were in the audience. We really enjoyed hearing Lone relate her experiences with orangutans in Borneo. We thoroughy enjoyed everything she had to say, as well as the ambience of the village hall - with its decoration and friendly lighting - and the way we were made so welcome. We were thrilled to find out there are more speakers we are interested in hearing and we will definitely attend again. Thank you for arranging such pleasant evenings - Josie Just, Witney and Tatiana Iseborn, Kidlington. It was wonderful to hear about the work that Lone and her team are doing out in Borneo. To see some of the pictures and hear some of the stories makes you realise how much they are doing to save these orangutans as their natural habitat is cut down and burnt around them. Once again, a really fascinating talk - Susie Smith, Wootton.